The Rebel Sweetheart. : Pucker Up! | Maybelline Color Sensational Creamy Matte Lipstick. Pucker Up! 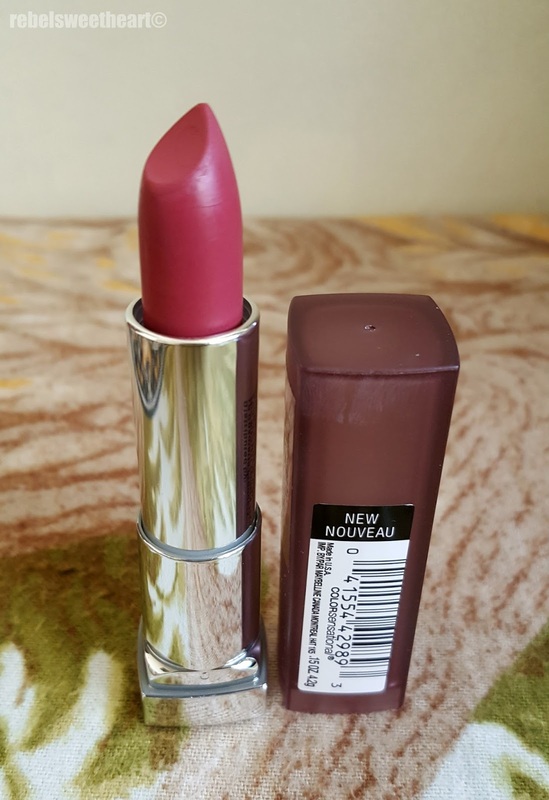 | Maybelline Color Sensational Creamy Matte Lipstick. What do you usually do when you're killing time at the mall? Hang out at coffee shops? Watch people? Window shop? 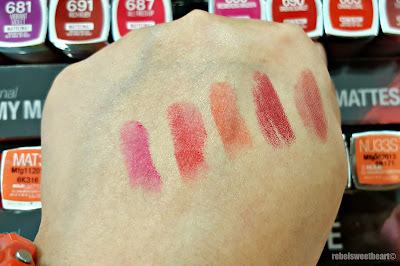 Me, I like hanging out at makeup counters and swatching products - more specifically, lipsticks. 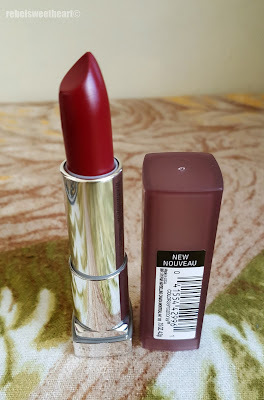 I was at the Maybelline counter some two weeks ago and that's when I first fell in love with the Maybelline Color Sensational Creamy Matte Lipstick. I swatched several shades of different lipstick variants but these Creamy Matte ones really piqued my interest. I was able to resist buying them at that time, but only because I kept telling myself that I have yet to use the lipsticks that I bought in Korea. One week later (last Friday, to be exact) I was back at the Maybelline counter, not swatching, but actually purchasing them lipsticks. 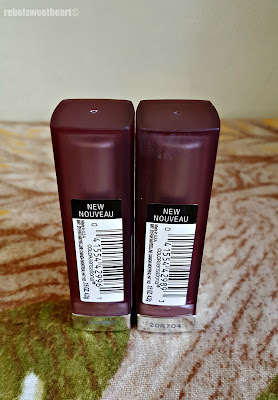 I just could not resist any longer, especially after Maybelline announced on their Facebook page that these Creamy Matte lippies are on sale for Valentine's weekend. Color Sensational Creamy Matte Lipsticks. Original price Php 299. 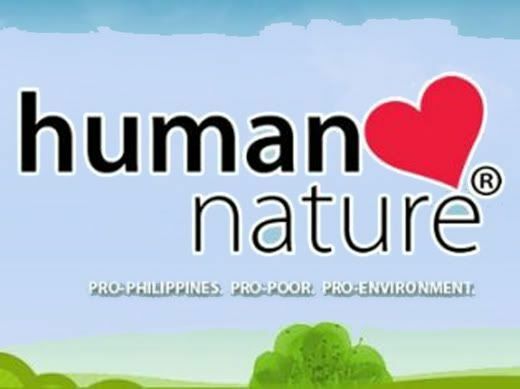 Sale price Php 199. There are 20 shades in the Creamy Matte line, but only 10 shades were on display at the Maybelline counter. All of the shades were gorgeous, but I had to limit myself to just two. And because most of the lip products in my stash are either pink or red, I went for the 'darker' shades in the selection - Touch of Spice and Divine Wine. Finally gave in to the temptation! Because a girl can never have too many lipsticks, lol. Divine Wine and Touch of Spice. Touch of Spice on the left, Divine Wine on the right. Divine Wine, the darkest shade in the collection, is a deep shade of red wine with brown undertones. 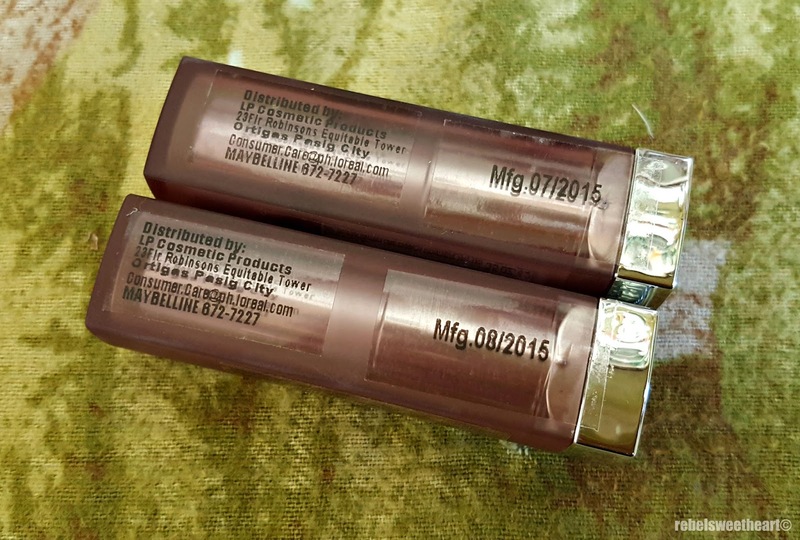 This shade has amazing pigmentation and is incredibly long-wearing. I ate a full meal, drank water, had coffee, but the color on my lips still looked perfect - as if I had not eaten or anything. 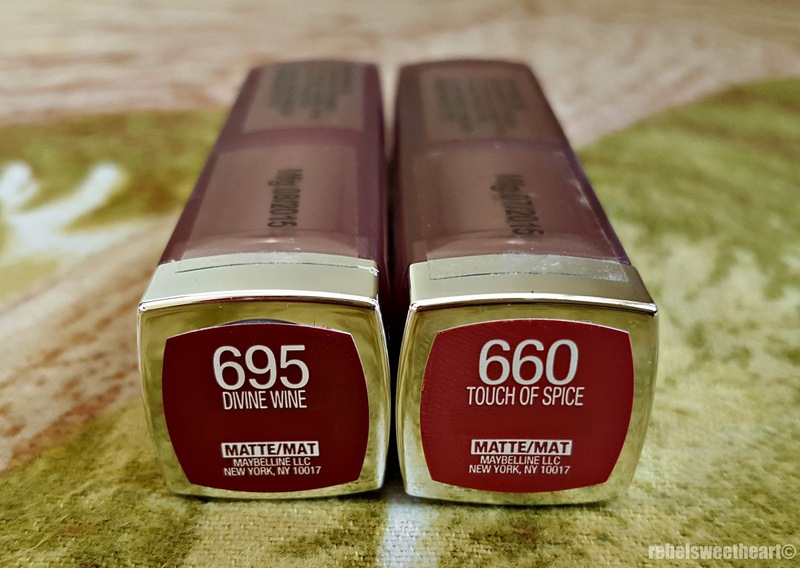 Touch of Spice, on the other hand, is a muted shade of plum with brown undertones. 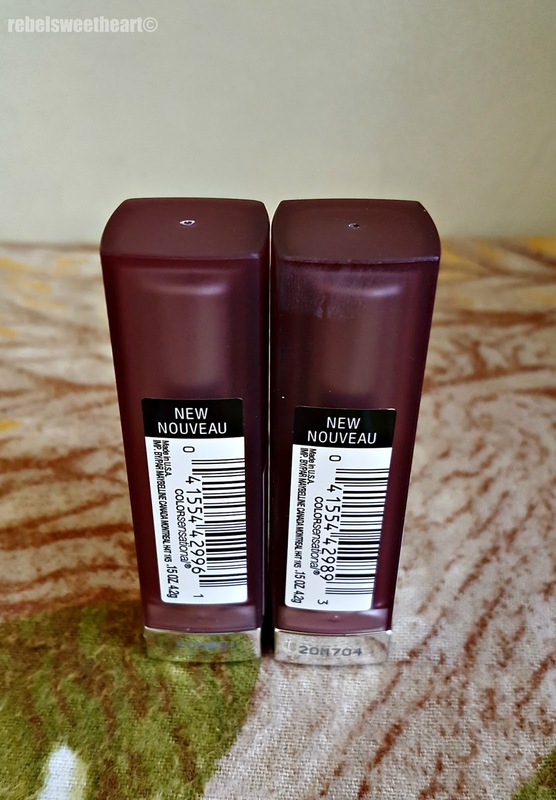 The shade is perfect for daily wear and is neither too brown to look like something my grandma would wear, nor is it too purple to look vampy in the daytime. 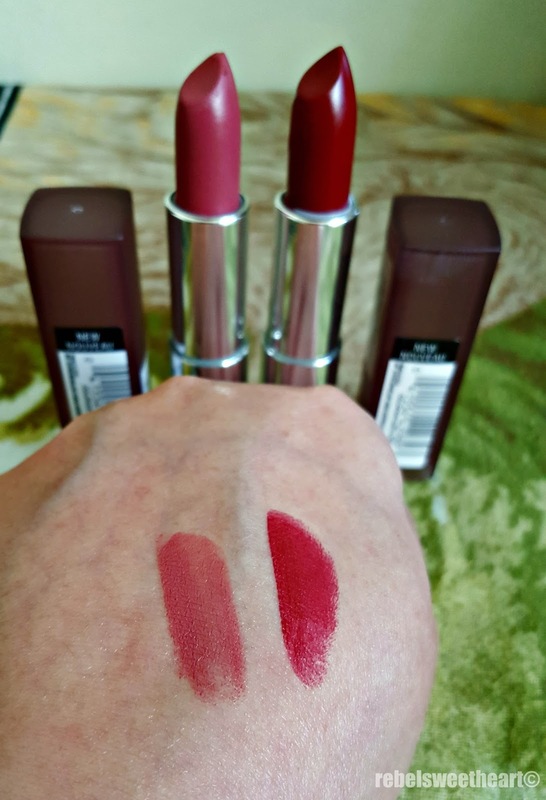 I love, love, love, the texture of these lipsticks. They're creamy and buttery at the same time, and they leave your lips with a lovely, matte finish. They're very easy to apply, they smell nice, they don't tug, and they glide on your lips like a dream. Most important of all, these lipsticks don't feel dry or heavy on the lips. Touch of Spice on my lips. Divine Wine on my lips. - Divine Wine's color transfers a bit (ergo, it leaves a stain on your coffee cup, on straws, anything that comes in contact with your lips). - Touch of Spice tends to accentuate the lines on the lips after a few hours of wearing. Other shades available from L-R: Mesmerizing Magenta, Siren in Scarlet, Craving Coral, Divine Wine, Touch of Spice. Ganda no? :) Si Mommy Pehpot din may Creamy Matte collection hehe! I love that they now have a matte collection! Really like the divine wine shade! Pretty colors! I would love to try the Touch of Spice, though it's very autumny love the boldness and richness. Loving that Divine Wine red! It looks great on you. It's hard to find a red that stays on. Love all the shades of lipstick given here. Maybelline is a superb brand!! The lipstick is pretty. I like to hang out at the fragrance counters sometimes when there is time to linger at the mall.